"I’ve lost 96.5% of my excess weight and I’m so proud of it!" 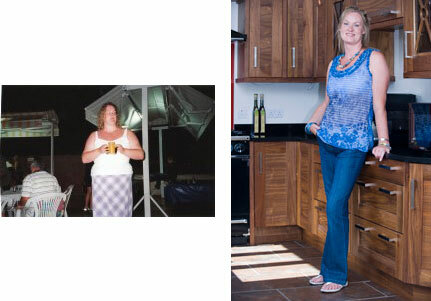 Suzanne, 37, who runs a property development company with her husband, has suffered with weight gain over many years. ‘I’ve tried every diet and every tablet.’ About 10 years ago doctors found she had polycystic ovary syndrome, a medical condition which can sometimes hinder weight loss. Her husband initially didn’t want her to have surgery because of the risks associated with her obesity, but he went along to the support groups and talked to Phoenix-Health surgeon Rob Macadam, who put his mind at rest. Before her procedure Suzanne went on a special pre-op diet and lost 18 pounds in two weeks. ‘The day of the op was a bit nerve wracking. I was the only person having the op on that day and I had to walk to theatre and climb onto the operating table myself which was a very bizarre experience. Everyone put me at ease and told me this was common practice for overweight patients undergoing this op. The Spire Murrayfield Hospital itself was spotlessly clean and I was so well looked after by Mr Macadam and his team. The nurse was absolutely brilliant, too. She was with me all through the night and didn’t leave my room. I was at the Spire for four nights and from the beginning to the end of my stay the Phoenix-Health team was absolutely superb.